Home » DMHP » School Psychiatry: Charting the landscape of mental health interventions in schools. School Psychiatry: Charting the landscape of mental health interventions in schools. My presentation at Central Tranvancore Psychiatric Society (CTPS) monthly meet at Kottayam yesterday, was on the topic of mental health interventions in schools. Prof Varghese Punnose, HOD, Dept of Psychiatry, Gov Medical college, Kottayam was the chairperson. 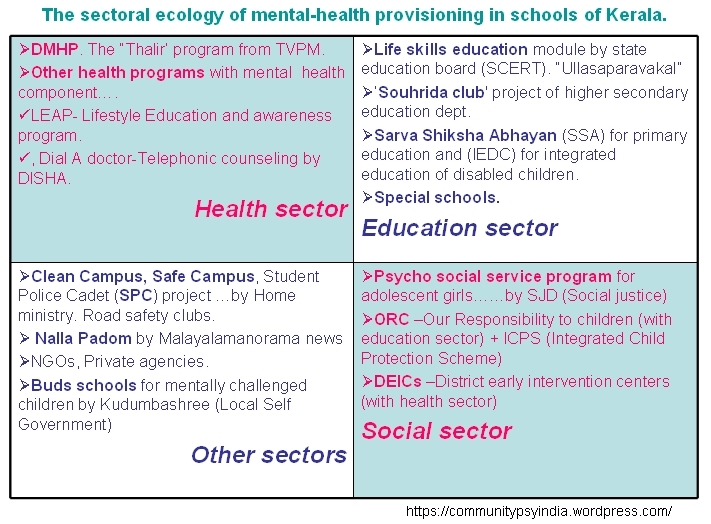 See above a matrix of existing mental-health provisions in schools of Kerala and see slides of my presentation below. By kumarRam in DMHP, Mental Health Policy on November 21, 2014 .